Create your very own Sesame Street scene with the Neighborhood Maker Coloring Activity Set! The large color sheets include both interior and exterior coloring scenes, and can stand up (along with the character pop-outs) in the included bases to create a 3D playscape. 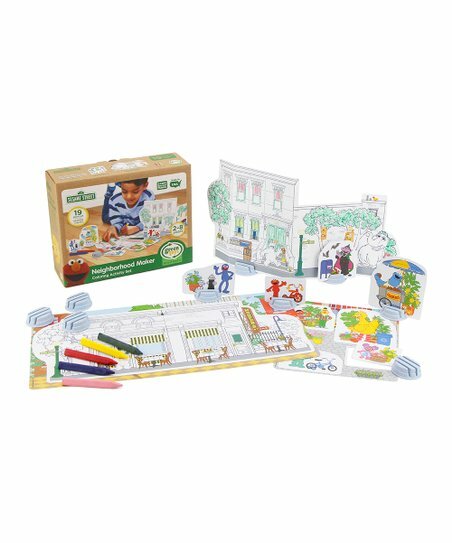 This 19-piece set helps develop fine motor skills and encourages creativity and imagination. Includes: 10 bases, 2 pop-out character sheets, 2 double-sided neighborhood coloring sheets, and 5 crayons made with soy and beeswax.